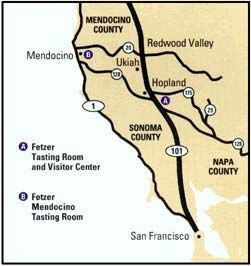 The Tasting Room & Visitor Center is open daily 9 a.m. to 5 p.m.
Fetzer vineyards, just down the road from downtown Hopland has two Avcons for their Ford Rangers at their food and wine center. If you're coming from the San Francisco bay area, we are two hours north on Highway 101. When you get to Hopland (next town north of Cloverdale), we are just 3/4 mile east of Hopland on Highway 175. . Visitor Center, tasting room, Bed and Breakfast. Check their Web site. Please call 800.846.8637 or 707.744.7600 for further information.